Hope everybody is doing well! We had some real 'fall' weather today with leaves falling all over the place and an all-day rain. Guess that can only mean one thing...New leaves are starting to bud out...the old leaves are falling all over the azaleas that are blooming! We're all doing fine, though. Thought you all would enjoy seeing Duke in his real winter coat. It sure has made the others jealous, however 'Baby Boy' is quite the proud one! Around town, the new Medina Medical Plaza(a.k.a Medina's Pizza) is opening for business. Meanwhile, across the street, the Circle K has undergone a facelift inside and outside with a gourmet coffee corner and bistro to go with gas and groceries. Real exciting, isn't it?? We fed the Elders last week and I asked them to come down hard on us because we need to be bolder in opening our mouths. A day or so later, Mom was talking to an old friend who works at St. Cloud Florist and asked her if she'd like to read the Book of Mormon and she told Mom she'd love to. She asked if the missionaries could bring it by, but there are some husband issues, so we'll take it a step at a time. Here's a morning shot of the lone pine in the back. It was early in the morning and this was one of those rare shots when the light was perfect. Never forget how proud we are of all of you! Mom and I hope everybody is doing really well! Old Man Winter really paid us a visit this past week, with freezing temperatures for 4-6 hours non-stop! We had freezes 2 nights in a row and it hit all the fruit trees, the ferns, and the staghorn fern out front(see the pics). Oh yeah, don't feel too bad for us, it was 75(and clear) today...Also included is our new sign at the front gate! Budinger Road, which used to dead-end at the turn-off to the city dump, is now paved and goes all the way down to New Nolte Road, near St. Cloud Elementary. It gives everyone another way to get into town besides Canoe Creek and Old Canoe Creek Roads. The ward is doing fine. Cooper Cox was ordained a Teacher today, Sister Danley is recovering well from back surgery(she had a titanium rod placed along her spine), Emily Munns is really getting big(she's having a boy), Sister Melik is expecting a boy(after 3 girls), Kami (Pratt)Bova is expecting(? ), and Monica(Fertic) Wright is expecting a boy. Good crop of future missionaries. Brook Pratt got married at the Manhattan Temple this past week and all the Pratt clan was up there. Lauren Solomon has started her missionary paperwork and will be home late this week to start the interview process. Mom and I started working at the Temple this week. She goes every Tuesday(starts at 715am) and we both go every other Friday evening. 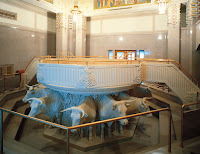 Its a wonderful thing to be doing and the folks who work at the Temple are absolutely great! Just to prove I am doing my part, I've included a picture of the new me, minus the swatch of hair just above my lips! A small sacrifice for the experience! Our hope for everyone is that we all remain steadfast and immovable and always abounding in good works. The Lord needs his people to be steady, consistent, and dedicated. Be prayerful about your decisions and take all of your problems, concerns, and fears and lay them at the Lord's feet. He has the power to help you overcome and conquer everything. Oliver Wendell Holmes wrote: "Greatness is not in where we stand, but in what direction we are moving. We must sail sometimes with the wind and sometimes against it...but sail we must and not drift, nor lie at anchor." We love you all and are awfully proud of each one of you! Happy New Year! Its hard to believe it is 2009 already! One of our New Years resolutions is to try to live life more simply than we have. In an age when technology keeps you literally connected to the world, it is more important than ever to keep our priorities in focus and remember to not go after 'things' that really have no value or worth in this life. We must try not to compare ourselves or situations to others because we can always find those who 'seem' to have it better, but who in reality have their own set of troubles which are equally as challenging to them. Just a few scenes from Christmas time in Florida. From Mom's traditional 'Nativity Row' next to the kitchen sink to the tree with very familiar decorations to a hodge-podge of color to....what's that? Snow in Florida?!? Not exactly snowy weather Christmas Day, but there sure was a lot of foam on the surf at Melbourne Beach! What an absolutely wonderful couple of weeks we've had with everybody home! Sadly, the time passes far too fast and its suddenly time for everyone to go back to school, work, and their own homes. Thanksgiving time reminds us about all of the blessings we have and we all hopefully name 'family' at the top of that list. The 'Proclaimation on the Family' promises, to all, that our greatest happiness and joy in this life comes from our immediate and extended family members. To our children: Mom and I are incredibly proud of each one of you and the good choices you have made and you are the joy of our lives together! To our son-in-laws: We love you like our own and are grateful for the valiant men you are. The new family members and friends you bring have enriched us! Another great lady in our family is your great-great grandmother, Ruth Anita Jones Chisholm. From her pictures you'll be able to see the resemblence to Momma and now you know where Momma gets a lot of her beauty! 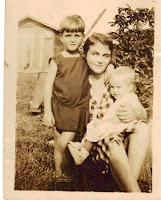 Ruth Chisholm (aka Mommie) was Nana's mother. She was born in Tennessee(in 1889) and moved with her parents to Florida when she was very young. Her father, Caleb Jones, was the pastor who established and built the First Presbyterian Church in Kissimmee(historic landmark). Ruth met her future husband Andrew Chisholm(also a pastor) at a church service where he was speaking after a friend encouraged her to go along. Nana was the oldest of their 4 kids and there was also Burke, Ralph, and Andy. The family lived in Kissimmee for a while before moving to Orlando, on Lake Pineloch. Ruth was always 'dressed to the nines' and properly coiffed(always used Pond's cold creme every night), she loved gardening(hence Nana's green thumb) and is remembered for her great sense of humor! Her rose bushes were incredible and she could easily root a cutting and raise it until it was a bush. 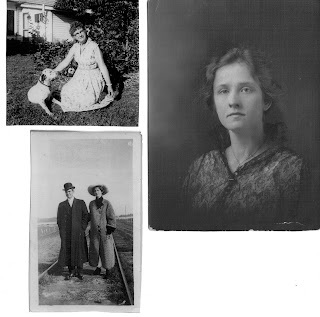 She was also a great seamstress and during the Great Depression would sketch the clothes in the department store display windows and would take the sketches home, make the patterns, and create the same clothes for husband and kids. During World War II, she worked at the canning plant in St. Cloud(now a part of Peghorn Park). On trips to the beach, she would tie ropes on the boys' legs and tie the other end to her own waist so that if they got into trouble in the water she could pull them out! She could definately see the bright side of things and knew how to live life well until the day she died(1972).